The latest version of SOAtest 9.10.0 comes prepackaged with Selenium-Version: 2.53.1. Currently, there is no version of Selenium (non-Marionette) Firefox driver that fully supports Firefox48 and higher. 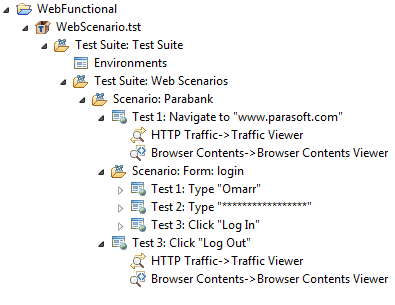 This is not a limitation of the Parasoft tool, but a limitation of the Selenium Webdriver. Furthermore, the latest version of Chrome55 contains a core browser issue that can prevent SOAtest from recording with it. Below are a few possible solutions to work around this. Download Chrome54 / Firefox47 or below. SOAtest 9.10.0 should record and playback successfully with these versions. 1)Close the page and "Stop Recording". 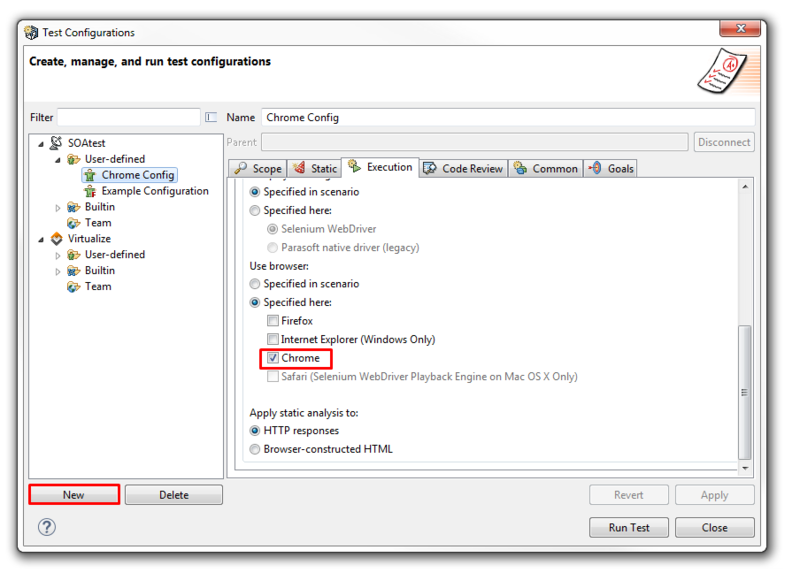 2)After stopping the Recording, expand the Test Suite created and right click the child Scenario in the test suite and select "add new test suite". 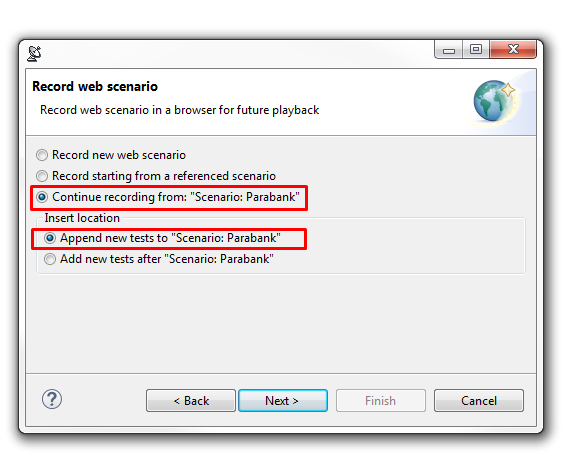 3) Select Web>Record Web Scenario and click Next in the Wizard. 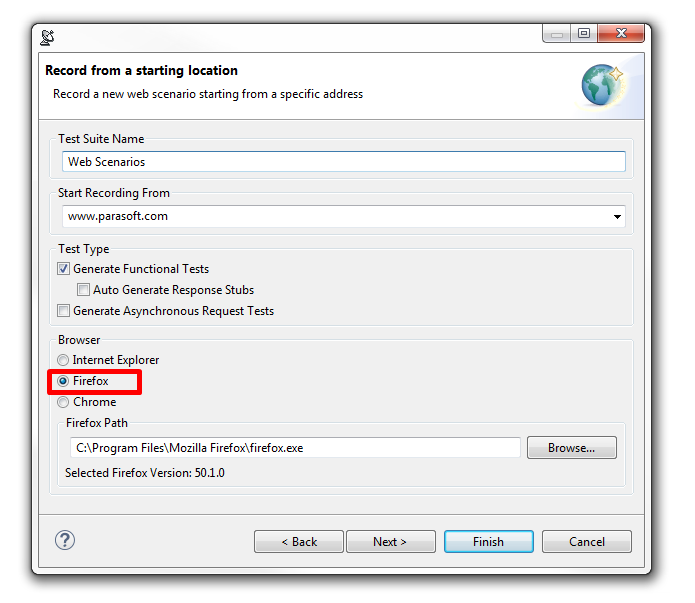 4)Select "Continue recording from: "Scenario:xxxxxx" and select "Append new test to..."
5)Select Finish and continue recording with your desired Browser selected. 6)After you have finished recording, close the browser and "Stop Recording". After this, your recording should have been captured and appended to your current Test suite.